Many cities manually collect traffic data and base traffic management designs on industry standards rather than local information. For example, engineers might count cars at a certain intersection at various times of the day and then time signals based on a standard set of recommendations. The problem is that traffic patterns are constantly changing and a one-size-fits-all approach is rarely optimal. Sporting events, festivals, holidays, road closures, emergency vehicles, pedestrians, and other factors also influence traffic patterns in unpredictable ways. 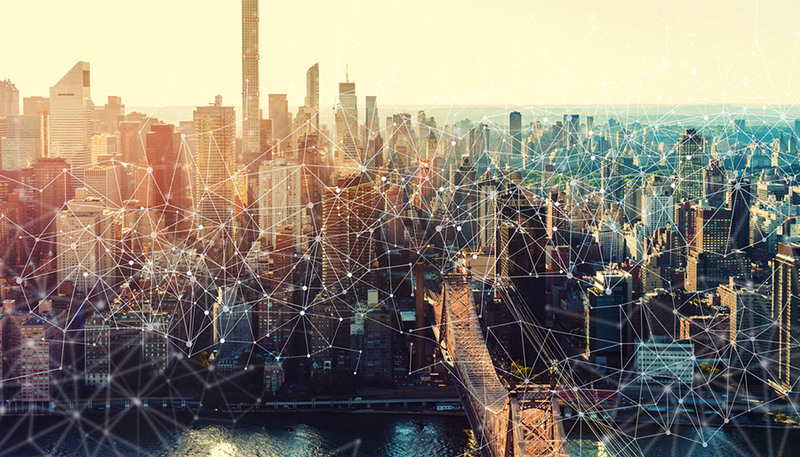 New smart city technologies solve these problems using real-time data and communication, but there are potentially costly infrastructure requirements. For example, video cameras require fiber (rather than 28.8 modems), which costs upwards of $10,000 per mile for the cable and labor to install it. In this article, we will take a look at new technologies for connecting devices and intersections that can provide the benefits of smart city infrastructure at a fraction of the cost. Phone lines (28k or 56k modems) and fiber (cable) have been the only options for high-speed data transfer for the past several decades. Of course, phone lines are too slow for many applications and fiber is extremely expensive. But now, high-speed LTE cellular modems have created a wireless fiber. The rise of LTE networks throughout the country means that cities can connect traffic signals, video cameras and other intersection devices using affordable cellular modems. Current 4G technologies have a peak of about one gigabit per second, while upcoming 5G technology will be much faster. Gigabit LTE and 5G technologies even include protocols for emerging use cases—including smart cities. For example, LTE Direct, LTE Broadcast and C-V2X functionality enable device-to-device connections without having to traverse large networks, making it ideal for Internet-of-Things (IoT) applications. These wireless technologies are built into many new smart city technologies, but they can also be added to existing traffic infrastructure. As a result, cities can realize the benefits of smart city technology at a fraction of the former cost. Most traffic engineers are familiar with smart intersections and pedestrian crossings, but these are just some of the areas where wireless-enabled smart city devices can be deployed. Nearly any device can be connected to provide real-time data and analytics to traffic engineers. Download our checklist of ways to leverage your smart city connected devices. School Zone Flashing Beacons: Connected school zone beacons can make it easy to change schedules when school is canceled or after-hours events take place. Engineers can make these changes remotely without having to visit the site. Next Generation Preemption: Rather than relying on line-of-sight preemption, smart preemption systems combine cellular and radio transmission with GPS to clear an entire route as soon as a fire truck leaves the station. Add-on Communication: New technologies can add pass-through communication to existing traffic signals to dynamically update timing and alert engineers when problems arise. There’s no need to invest in completely new systems. New Parking Solutions: Information from parking facilities can be displayed on electronic signs throughout a city. Within a parking garage, drivers can see exactly where spaces are available based on the presence of a vehicle. Connected Vehicles: Automatically see the location of snow plows, mobile weather stations, and other municipal vehicles, as well as monitor payloads, temperature, and other data through connected vehicle systems. Live Video Feeds: Live video can be extremely useful for monitoring traffic conditions, and the data generated can be analyzed for insights into trends and patterns over time. With the rise of connected vehicles, smart city technologies will be able to respond to real-time traffic conditions without having to rely on pressure sensors or live video feeds. Vehicles could communicate directly with traffic infrastructure to optimize traffic flow. 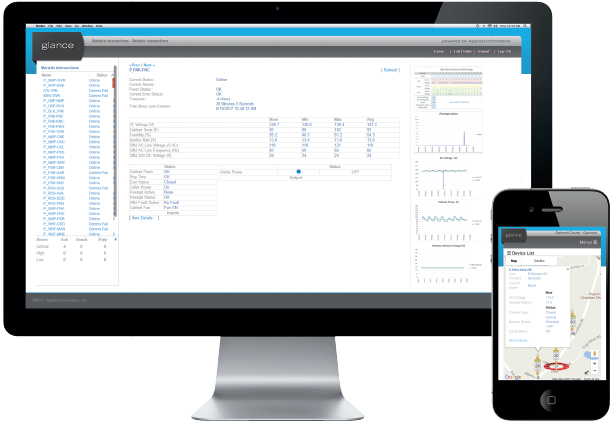 Smart central systems can aggregate data from connected devices to simplify management and provide insights. For example, the Glance Smart City Supervisory System enables cities to manage all of their traffic and ITS assets within a single easy-to-use, web-based application that’s accessible from any mobile device or laptop. Reduce downtime and improve response times by knowing the location and status of each unit before sending service personnel. Securely VPN into cabinets to see the real-time status of AC power, battery backup, cabinet flash, stop-time, switch doors, fans and more. Dynamically control message signs, portable signs, overhead detection systems, wrong way detection, warning signals and other assets. Track vehicles in real-time and play back events to see how emergency vehicles, slow plows or other municipal vehicles responded. Analyze historical data to derive critical insights into traffic patterns. The same data can used to help motorists and pedestrians. For example, the Glance TravelSafely smartphone app connects users to connected traffic intersections, school beacons, motorists, cyclists, and pedestrians to provide real-time feedback on road and traffic conditions. 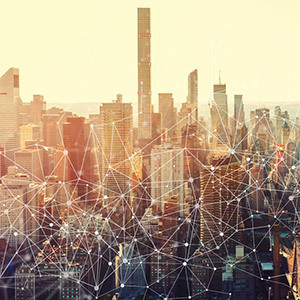 Don’t forget to download our checklist of ways to leverage your smart city connected devices. In the future, this kind of data could be sent directly to connected vehicle dashboards—rather than just smartphones—to provide helpful real-time alerts to motorists. Smart city technologies have the potential to improve safety, reduce congestion and even reduce greenhouse gas emissions. Until recently, they required a significant investment in fiber to enable high-speed data access. The rise of LTE communications has changed these dynamics and opened the door to new smart cities. Download our checklist of strategies for realizing the benefits of your connected smart city devices.